Time, money, and love -- three fundamental ideas running our lives. Of these three, only love is real. We do everything for reasons of love, avoidance of love, or neurotic displacement of love. Time is not as real as it looks and feels. The time of physics is a quantity within equations. Human time is different. The past may appear distant or close in time depending on how we feel. Time may move slowly or quickly. Look within, you'll see this is true. Money is a symbolic substitute for love and time. Money is our civilization's most powerful force; we give up freedom, love, and time for money. Too much focus on money, you risk no time for the love in your life -- friends, children, and good works. Too little money and your spouse may leave you. With enough money "everybody loves you" for your money. "Time saving machinery" is now so effective that we could get ten hours of work done in two hours. It should be heaven on earth by now. But heaven never comes, and keeps waiting for better and faster technology. With every increase in machine/computing power we invent new tasks and expectations. The carrot recedes into the horizon with nonstop working and shopping seven days a week, twenty-four hours a day. Forget the Sabbath -- only God gets to rest on the seventh day. How can we handle intense feelings when they take over the mind? Feelings so strong that they have a life of their own. Some of these feelings could be positive, some quite negative. The point is that you have "lost your own mind" and are now occupied, controlled by these feelings. The sense of openness and freedom is lost. What to do? Watch, just watch your feelings while you feel them. They will pass. And, return. And, pass. And, return. We may also have to work out the feelings by talking, writing, and exercise. Walking a fine line between "fanning the flames" and repressing the feelings. Just watch! Keep coming back to center - to the eye of the paradox - where there is peace. The ego steps away along with the feelings. Soon those feelings transform into the deeper insights of wisdom. from below us, what do we do? that no solution, no shift is in sight. Nothing at all. Just wait. That's what it's like now. grip you all over; what do you do? A moment comes. You are lost. But it's okay. No escape. & now. Let it change. feeling. It's fear becoming love. My childhood was spent on a dairy farm in Los Angeles County. Telephones were still luxuries. It was a big deal when we got a four-party line (yes! four households shared the same line). Phone bandwidth was expensive. Only the wealthy had private lines. On Sundays friends and neighbors would drop in on each other unannounced. In those days, existence had a more tangible personal feel to it. Phones became cheap; and the Internet made communication faster and even cheaper. Today we send messages everywhere on Earth at a moment’s notice. But, are we closer now than the neighbors who knocked at each other’s doors on Sunday for a visit? Are we getting more “free time” by flooding each other with more email and cell phone messages? I don’t think so. In fact, I suspect that we are now lonelier and more confused. We think we’re more connected – but spend more time skimming massive quantities of messages and images coming to our computers screens, cell phones, portable audio headsets, televisions, and radios everywhere. Less and less time, do we spend face-to-face with each other. Juan Mascaro, in his introduction to The Upanishads, wrote: "... our life should perpetually breathe the air of love, since love is the living breath of the soul." Some people positively enhance a room's atmosphere as soon as they walk in. Such people are remembered for the feeling of their presence, not so much what they said. We all create an atmosphere around us. It could be fear, anxiety, joy, love, and more. Our states are shared spontaneously into the world around us; this suggests an ethical dimension to our states of being. Personal growth processes, including meditation, are so important because they provide deep inner feedback on our own states, allowing room for improvement. A most valuable state is simply unqualified presence; the feeling of being-here with full intensity. In simply being present we open ourselves and those around us to being fully alive as-it-is. This the among the greatest of gifts. When you are really here, you help others to arrive here too. Life becomes more abundant. We naturally act with kindness, gratitude and love. Milton's Paradise Lost sings of the Fall from the Garden of Eden. Now, we need a poet of our time to sing of Quiet Lost, the tragedy of lost silence, of a world filled with noisy machines everywhere. Go to a park and every few minutes, a jet will pass above - overwhelming sounds of wind passing through tree leaves and the bird songs. I went to a fancy gourmet food mall. Wonderful food. As I bit into a great tasting morsel, next to me were refrigerators pumping out so much noise that I felt my body and nerves vibrating - along with my digestion going South. I moved to another spot. Just as noisy. It amazes me that that we put up with so much noise! We've trained ourselves not to notice; but, perhaps, it causes dis-ease and disease in our minds and bodies. That is not how we evolved. Rattling machines can be silenced. It's a set of engineering problems that once solved would allow us to again feel and hear ourselves, our planet, our universe. I recommend the interview of Gordon Hempton On The Search For Silence In A Noisy World in the September 2010 issue of The Sun Magazine. 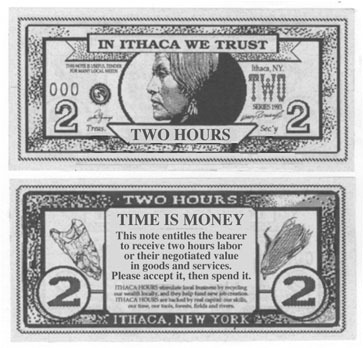 Story HOURS currency by its founder, Paul Glover in Winter 2012 issue of Positive News. It's not either/or, we can have both. There's the idea that money is rational. Get the most for the least money. Buy high, sell low. Get the best paying job. Or, get the most pay for the work you like. But, if you look at the way we play money these days, money is uncoupled from meaning, love, and all that is divine in human life. Why? Because we have learned, as a culture, to put money first and all else below that. This is a prescription for corruption. National politics now suffers from the fact that "money has no intelligence but money" - basically, money wants to make more money. You invest in a candidate that will help you get more money. It does not matter who. It's the money that counts. This is stupid; and, now we have stupid politics. One man at early morning coffee table said, "We got better presidents when they were selected behind closed doors at political conventions - men such as FDR, Eisenhower and Kennedy." Now, winning means getting the most money behind you, and running ads to hypnotize the voters into the "best candidate that money can buy". There's too much communication & not much understanding. It's easy to pour words and sound bites out into the electronic atmosphere. But who's listening? You? Me? How much can I listen, read, or watch in one day? It becomes easy to neglect one's own mind and deeper truths. To understand is to "stand under" - to get below the surface. This takes time. Time to stand in silence. Time to listen, and allow what-is to disclose itself. The world is changing. It always changes. So many of my peers in age fear the future. It will not be the same. I was reading this morning about the tragedy of the north American Indians as their cultures become invaded by European cultures. Suffering and death by disease and violence that reflect some our worst images of the future. Indeed, the worst has already happened. Now "we" are here. Hold on for the ride. Nothing new. But, let's do better. No excuses. I feel change in the air. It's time to be more informal and spontaneous. To be more ourselves in our personal and public lives. Looking good is not as good as being good. Many people feel the world is "on the edge" with uncertainty. I don't know. What we are going through is not new. We're on a small planet now. Lots to learn and change. Perhaps, these are "New Times". The past ten years many folks felt that this new year - 2012 - will be the moment of a huge paradigm shift. Some thinking it will be an "end of the world scenario". I don't know. Better not to make any year or moment that special. To paraphrase an old rock song: something is happening here, what it is we don't exactly know.